Are you a refugee or asylum seeker who needs help? We help refugees and asylum seekers in Suffolk, including free advice sessions and English classes. Are you interested in helping refugees in Suffolk? We rely on donors, volunteers and members to make our work possible. I want to support refugees. We rely entirely on donations and grant funding for all our work helping refugees rebuild their lives in Suffolk. Click here to download our refugee stories booklet. 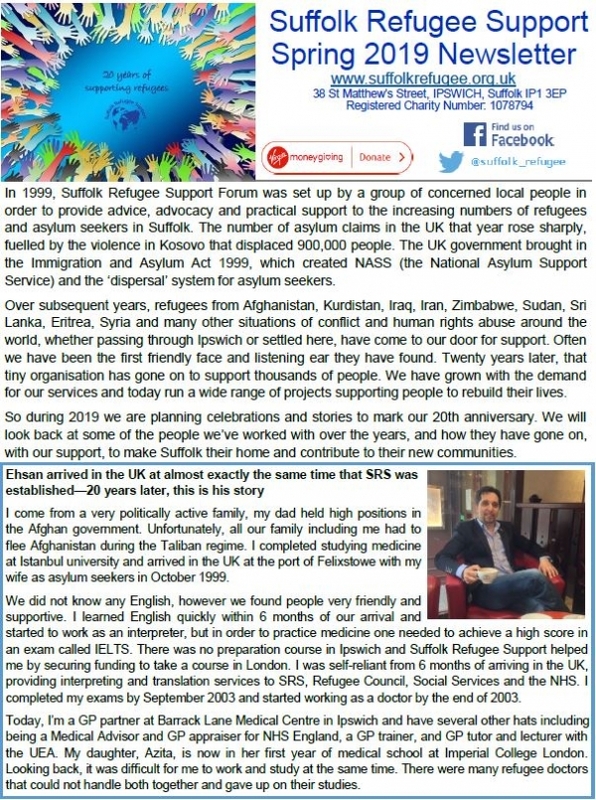 Welcome to the Suffolk Refugee Support website. We are an independent charity giving practical support to refugees and asylum seekers in Suffolk. Our staff, volunteers and trustees are proud to have helped so many people to overcome past trauma and rebuild their lives as successful members of UK society. We couldn’t do our work without the kindness and generosity of our supporters and donors, or the resilience and determination to get on with their lives shown by so many refugees. Thank you.